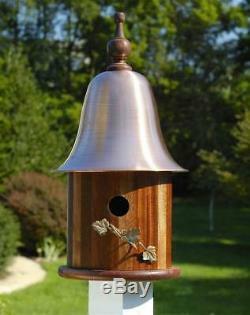 Ivy House Bird House w Mahogany Wood Copper Roof [ID 8974]. Spun copper roof topped a wooden finial. Copper climbing vine for a perch. Roof removes for easy clean out. Mounting bracket and screws included. Hole works for chickadee, bluebird, nuthatch, swallows, titmouse and wren. If you have specific questions about this products guarantee, please contact our Customer Service department. The item "Ivy House Bird House w Mahogany Wood Copper Roof ID 8974" is in sale since Friday, April 27, 2018. This item is in the category "Home & Garden\Yard, Garden & Outdoor Living\Bird & Wildlife Accessories\Birdhouses".